Anything but simple, the Basic Knives collection is a design by Caroline Noordijk that brings tons of functionality and increased productivity into the kitchen. Utilizing the flat, empty surface of the blade, Caroline incorporates other kitchen tools into the knife. This eliminates having to switch tools and saves time. Having a peeler, grater, zester, or a measuring spoon in my hand at the same time as the knife would do wonders for speeding up my dinner prep time. No word on price or availability as it is a design, but surely someone will pump these out some time soon. If only they could make a knife that can also cook a steak or at least has an iPod in it. Really by now I would think that someone would have already done that. Knives function best as knives. 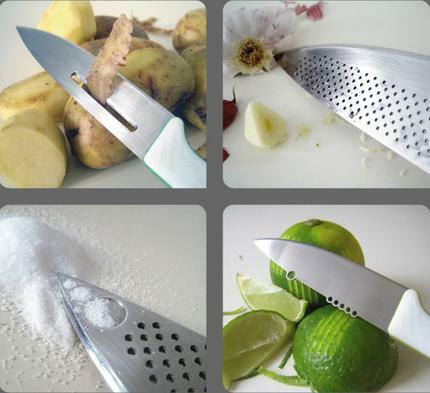 I’d never feel comfortable flipping my chef’s knife around and using it as a grater or a peeler. I can’t even tell what that one with the salt is doing. Ten out of ten for inventiveness, but minus several million for such unsafe and potentially unsanitary design. I’m John Coploe from Singapore. 1. Could you ship the package to my country? 2. Could you accept Credit Card as payment method?